From the date-stamp on this post, you’ll gather I’m looking at the raw ingredients of a new year with knife poised ready to chop, mix and and musically mash. Or mosh, but more on metal next time. Meantime, in movie land, cutting rooms have been working overtime preparing a feast of feisty film for 2011. We can look forward to such cine treats as The King’s Speech, a new Pirates Of The Caribbean, the final, final Harry Potter and the eagerly awaited fourth Mission Incomprehensible. While it’s generally recognised that many cinema-goers have eyes to see and mouths for popcorn, critics rarely pass comment on ears and what they care to sup. OK, there’s the occasional nod to a musical morsels well done, but what about the trimmings? The atmospheric pads and SFX that provide necessary seasoning to bring out the flavour of a movie’s meat and potatoes? Sound designers spend an age in the wild with field recorders, shoving foley artists aside as they snuffle for found-sound truffles; swiping synths off their owners’ plates in pursuit of electronic sonics; oft paring to the quick and buying in convenience packs of samples when time becomes more precious than film’s most important ingredient, money. It’s that latter urge that Zero-G’s trio of cinematic sound slices serves to slake. 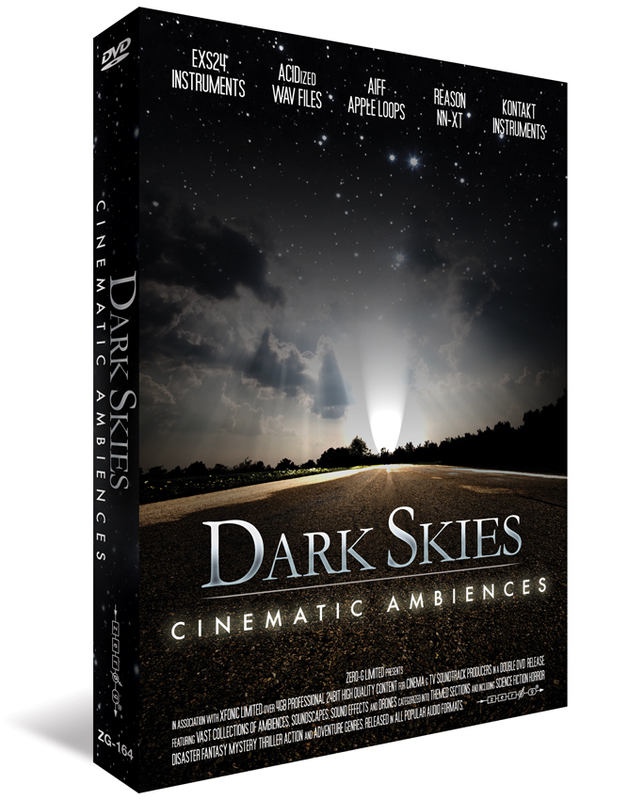 What we have is a six-DVD mélange comprising 27,276,871,134 scrummy bytes for 13,269 menu items (minus subfolders) of cinematic content. It’s ladled generously before film and TV soundtrackers, videogame developers and - yes! - adventurous muzos looking for the atmos, the dark, the huge, the disturbing and well spooky, chewing all points in between. Light and sloppy, it is not. 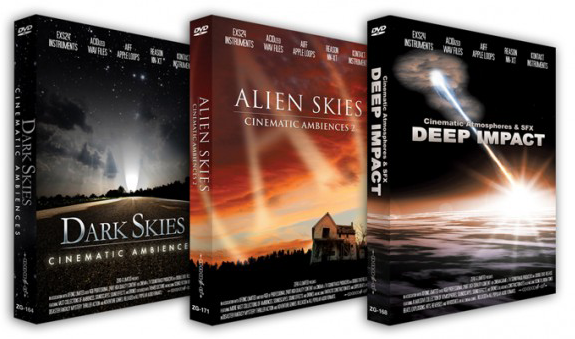 For each of the three titles, natural and synthetic sources have been culled, cooked with state-of-the-art studio gizmos and regurgitated as stereo, 44.1kHz, 24-bit files in various flavours. Fundamentally, they’re all WAVs and AIFFs, but the former are tartly ACIDized while the latter are juicy Apple Loops, so there’s plenty of embedded fodder for those on Sony’s ACID Pro, or shredding Apple’s Logic (or GarageBand, if you must). Further, if deployed correctly, the samples show up as pre-formatted instruments for users of Logic’s EXS24 sampler, Propellerhead Software Reason’s NN-XT sampling module and Native Instruments’ Kontakt 3.5+ über soft-sampler. Digging further into the collections’ layers, we’ve folders labelled Construction Kits, the contents of which enable you to concoct sample sequences in order to create whatever bed you care to lie in. If the notion of the construction kit is unfamiliar, let us let UK distributor Time+Space explain things by means of this video-dollop featuring Alien Skies and Kontakt, along with a quick look at how Apple Loops enliven Logic. Naturally, if you’re a devotee of neither the EXS24 nor Kontakt, nor the NN-XT, perhaps preferring Steinberg's HALion, IK Multimedia's SampleTank or other sample-replay platter, you may feel washed up. But with a little tinkering, you’ve plenty of fare by which to whisk up any flavour of custom configuration. As things stand, however, the full-phat Zero-G combo comprises a pre-cleared, royalty-free 2,260 ACID WAVs and 2,260 AIFF Apple Loops, while Kontakt, the EXS24 and the NN-XT are served 2,487 instruments apiece. If you can’t get anything out of that lot, perhaps you should be a waiter and consider acting. Of course, numbers are not all. You may be wondering why I’ve puréed all three titles into a single post. Well, here’s where the asterisk by the price in the header makes sense. *Time+Space is, until further notice, offering the trio as a cost-saving bundle. Each retails at £89.95 (€99, $149.95) and is available on both physical media and as download. En masse, they’re £199, which is a saving of just over £70 and constitutes a filling fillip for your sampling smörgasbord. You can examine the guts of Dark, Alien and Deep here, here and here, respectively. But for now, let’s purge the tiresome culinary and alimentary references and disgorge salient discourse on the flava of each. The key word here is ‘dark’. 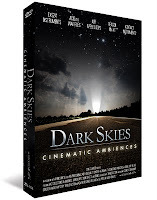 Dark Skies presents a sonic vista of dread intensity. The Apple Loops Construction Kits split into Ambient Score, Dark Score, Science Core and Textural, each of which has a sort of different character. I say ‘sort of’ because one person’s Twisted Chimes subfolder may be another’s Temple Chill. As has been spotted by other reviewers and assorted netizens, the content labelling and categorisation is, to an extent, subjective and, in that sense, somewhat arbitrary. Atmospheres are still atmospheres; sting still stings and hits still hits. But the differences between Hive, Stalker, Lower Realm and Hard Foam are down to your own sensibilities. No matter. As is the case with each title featured in this post, Zero-G has provided well-authored Cue files which give an overview of what one could do with the files contained in each folder. This makes it easy to decide which batch of samples are good for what and supplies a useful bunch of pre-formatted sample sequences that you can plop into your own works with not a care for rights’ clearance. Sequels have a bad rap in cinema. The studio will naturally want to capitalise on a successful film by churning out another in the same vein, but all too often the follow-up is a lame progression of the original. 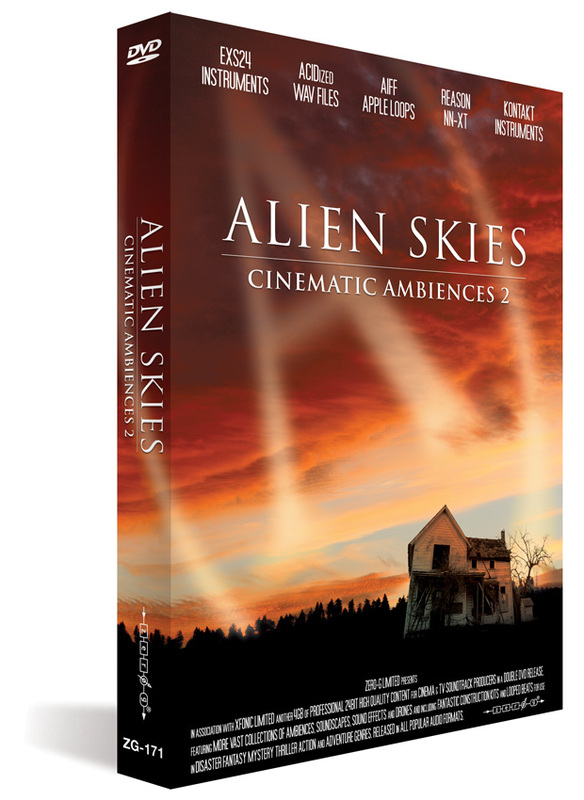 However, as with Alien and Aliens, Alien Skies expands the brand in cummerbund-bursting fashion. Zero-G claims to have gone the extra mile in terms of musicianship and studio wizardry, pouncing on such exotics as Ecuadorian folk strings, Indian flutes, found metallic percussion and industrial machines. The resulting raw mass of audio data was then further treated by 100s of audio-editing tools, resampled and organised into synthetic, and yet organic, instruments. 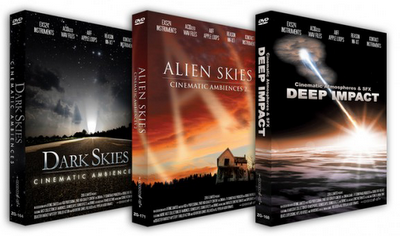 All the best trilogies come in threes, and Zero-G’s cinematic bundle is no exception. 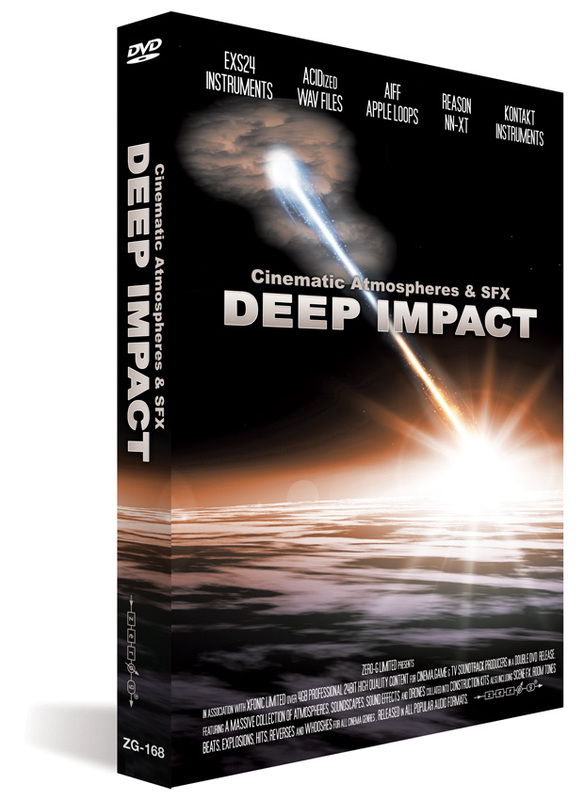 Deep Impact delivers yet more soundscapes, drones and textures, along with Room Tones, a variety of Whooshes and a folder full of Explosions. Yup, all good cinematic fare, but whack them on your musical tracks to persuade the audience you’ve gone bonkers. No issues with quality there, even if the files you hear are streamed MP3 copies, as are all the demo files in this post, and not the original full-bore WAVs or AIFFs. By now you’ll have an idea of whether what Zero-G offers is the sort of thing that would sit well in your work - these libraries will not suit everyone. But if looking for a cinematic edge, or branching out into film and videogame work, they represent a value-for-money investment that’ll save you a lot of time sourcing epic atmospheres, beats and special FX. Quality is definitely on the button and riffling through the numerous files may open fresh avenues of thought when casting a new piece. You might like to title such a work Deep, Alien And Dark.